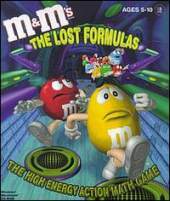 The 2 lead candies from the tv commercials are about to set off on a vacation until the red candy realizes that the yellow candy left the M&Ms Minis in charge of the candy factory. The Minis promptly steal the secret M&Ms formulas and cause havoc at the factory. It is up to the yellow candy to set the situation right. The gameplay has been described as being similar to the Crash Bandicoot series. The action in the game takes place over 8 levels. The first 7 levels involve some kind of math skill (configurable at various skill levels to cover addition, subtraction, multiplication, and division). The first level depicts the yellow candy frantically driving back to the candy factory. Along the way are math formulas on the side of the road, followed closely by 3 crates on the road, each with a number. Striking the crate with the correct answer for the previous formula will allow passage, while the 2 wrong answers are steel crates that will end your vehicle. The same action is repeated in a later level involving a forklift. Another type of level has the yellow candy jumping from number platform to number platform according to the math formulas that a disembodied female voice calls out. Another type of level is a 3D running/jumping action level in which the yellow candy will run down a hallway while observing clues about math formulas along the way. At the end of the hallway will be 3 doors, each with a possible answer. Choose wisely. All along the way are M&Ms candies to be collected in large quantities. Every 100 M&Ms candies earns the player an extra life.